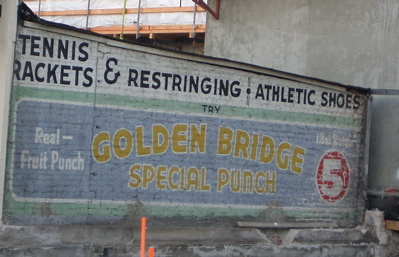 Try Golden Bridge Special Punch. Real — fruit punch. A nickel for a 12-ounce bottle. And get your tennis needs taken care of, too. Admittedly, such reflections are a necessary product of driving — even preferring to drive — well above the speed limits posted on our Dwight D. Eisenhower System of Interstate and Defense Highways and other fine public routes. I plead guilty. But. No matter how fast you’re going — the posted speed limit or 15 miles an hour over it — if you look in the rear view mirror and see someone bearing down on you from behind, that tells you they’re going faster than you are and you need to get or stay out of the way. The fact you’re driving whatever speed doesn’t entitle you to the left lane. The sane, courteous and cautious course is to get over to the right at your first opportunity. Let the faster traffic by; presumably that’s what all those “Slower Traffic Keep Right” signs are about. And also: When you’re going 66 and you decide to daringly overtake that car in front of you that’s going 65, watch what’s happening in the left lane before you pull out to do it. If faster traffic is coming up, either stand on it to make the pass and get it over with so you don’t hold up your sweet-tempered brethren, or wait until the lane clears and you can take your own sweet time (and 12 miles or so) to get past your barely slower neighbor. Next: The many uses of directional signals. If you’re like me — and thank goodness you’re not — you look at pictures from Iraq and say, I helped make that happen. I mean by helping pay for it, or more accurately, by chipping in on the interest for the big credit-card bill we’re running up to turn the Saddam-ruled wasteland into a wasteland ruled by someone else. Thanks to my brother John, I see that we all have another government-sponsored opportunity to contribute cash to the effort of building the new Iraq. It’s a new Web effort from the U.S. Agency for International Development (USAID) called Iraqpartnership.org. USAID has partnered with a celebrated and well supported online philanthropy outfit called GlobalGiving to allow Americans to give money directly to Iraqi redevelopment needs: water pumps for farmers, desks and blackboards for classrooms and the like. You know — this should be a good thing. If nothing else, checking out the USAID site on Iraq actually does give an alternative view of what our awesome national resources might be used for. Of course, it also makes you wonder about our schizophrenic feelings about Saddam-land. It’s not so long ago that we loved the Iraqi people so much that the only way we could find to express our emotions was through a decade-plus embargo that managed to enrich their unappointed tyrant and his cronies while inflicting a sort of collective punishment on the population. But that’s all water over the dam, which I think has been blown up, anyway. Iraqpartnership.org launched at a rather unfortunate moment — just after Hurricane Katrina, when governments at all levels were proving they were incapable of taking care of people in Louisiana and Mississippi, let alone along the Tigris and Euphrates. Americans were called on to step up and give whatever they could to storm relief. Maybe that accounts for the news that in its first two or three weeks, the Iraqpartnership campaign raised all of $600. That’s the claim published Sunday by the British paper The Guardian, which noted that the amount raised was roughly equivalent to what it would take to buy a couple of iPods. So, put together this $600 in citizen money to help Iraq and combine it with the 400 people who showed up the for the pro-war protest in Washington the other day. What do you have? I’m not sure, but I think it would be pretty hard to spin it as an American public willing to “bear any burden, meet any sacrifice” to sort out the hornet’s nest we’ve stirred up, Times have changed. We will be back before it’s over over there. The Wisdom of Crowds, 18th Century Style: An estimated one-third of the colonial population at the outset of the American Revolution supported the British. One-third were on the fence. One-third bought into the “life, liberty and the pursuit of happiness” thing enough to actively support the rebellion. Nice Phrase — Now Get Lost: In the Senate campaign of 1858, in which Lincoln memorably argued that “a house divided against itself cannot stand,” he lost. Evolution for the Hell of It: In the 1925 “Monkey Trial,” in which John Scopes was put in the dock for violating a Tennessee law prohibiting the teaching of evolution, Scopes was convicted. The law under which Scopes was prosecuted stayed on the books until 1967. See? The idiots always been in control, or waiting in the wings. 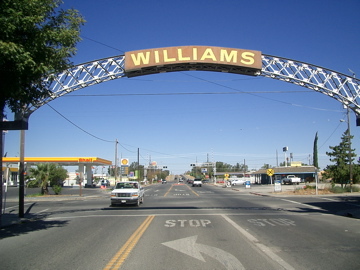 On any drive north or south on Interstate 5, Williams is an important spot on our personal travel map. 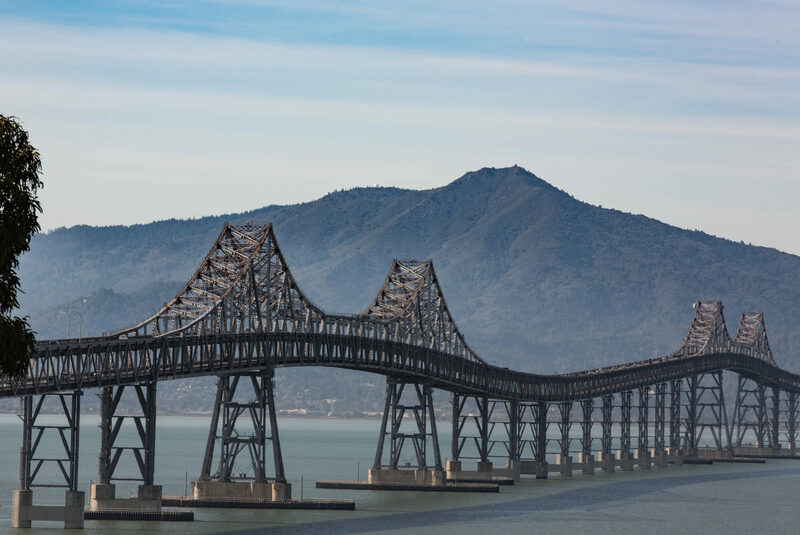 It’s 100 miles from Berkeley, give or take a mile or two; so when we get there on the way home, we’re within a couple hours of our front door at most; or, headed the other way, we’re about halfway to Redding (or about one-fifth of the way to Eugene). 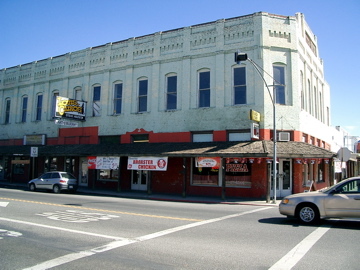 The town sits on the western side of the Sacramento Valley, where Highway 20 comes down from the Clear Lake plateau and heads across the river bottoms to Colusa, Yuba City, and Marysville before it begins climbing through the Sierra foothills to Grass Valley and Nevada City. Like all the little farm towns up and down the valley, there’s some history there under the surface, which naturally you don’t get at when you’re just passing through. 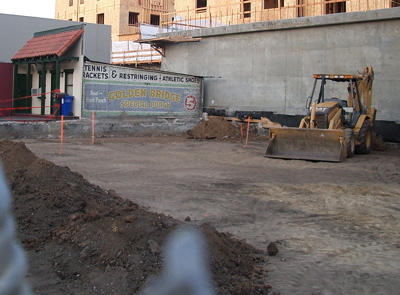 You sort of suspect it when you look at the handsome old brick building a couple of stop signs west of the interstate with its weathered pale green paint, arcade shading the sidewalk and and recently hung fast-food banners. The only history I know of, though, is what we’ve seen on our short stops through the years: the ghost Dairy Queen (we walked in one day after the place had been shut down, though all the signs and most of the interior fixtures were intact and the front door had been left open); the crummy road meals; the night we stayed in town with our neighbors, the Martinuccis, and drove out to the fields east of town to watch a comet; stopping for gas on the way home from Wilbur Hot Springs in the blaze of October. I’m writing from Berkeley again this evening. Kate and Thom and I pretty much finished the chores we wanted to get done up in Eugene by late in the afternoon. Then we all went and had pizza. And then Kate and I drove south along I-5, stopping in Medford overnight. But the chores: Nothing complicated, really. 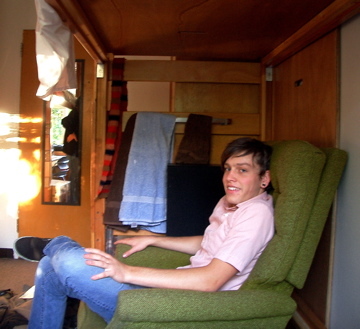 Thom wanted to find a chair that would fit into his deluxe living space beneath his loft bed. For extra points, it would be great if we could come up with a stand or table of some kind for Thom’s retro audio setup — think turntable and vinyl and old-school receiver and speakers. And it would be good if we could find the stuff for less than a fortune. Thom’s become something of a habitué of the local thrift stores, so we decided to go that route looking for the room furniture. First stop, on Friday, was a Goodwill in Springfield. Nothing doing, furniture-wise, though I did find a tie that features bottles of Tabasco sauce along with images of unshelled peanuts and pistachios. There’s just something off about it, which is why it’s appealing in a way that will make me keep it for some years and never wear it. Back to the chair: One of our other chores was seeing whether we could get Thom’s cellphone (or its battery) replaced. While we were waiting on the results of the battery test, we decided to drive out to Target on the west side of Eugene to pick up a few necessities (detergent, etc.) that we hadn’t rounded up before. On the way out West 11th Avenue, we passed a St. Vincent de Paul’s store with a ton of furniture out in front. I turned around and we went in to shop. There was one kind of nice brown plush swivel armchair on the front lot (the swivel feature was really what made it), but Thom decided to keep looking inside the store. They had some nice chairs that had been sold already. 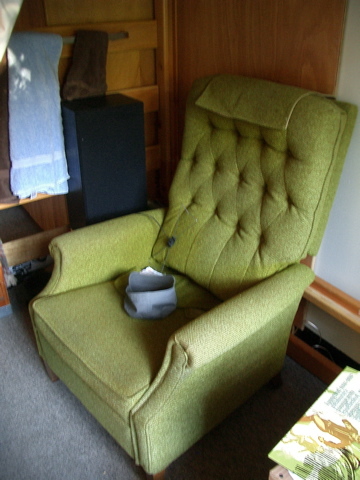 Then out in back we encountered what Thom called the most beautiful chair he had ever seen (a statement not necessarily an indictment of the kind of upbringing he had): a magenta chartreuse recliner. The Chair. I went inside and asked how much it was. The woman at the counter said, “Everything out back there inside the yellow caution tape is a dollar.” The Chair was in the designated one-buck zone. And it turned out to fit pretty well in Thom’s room, too; and more than that, just the fun of finding it&nbsp; seemed to make the rest of the moving-in experience come together. It is a cool chair. The first (and for now, only) order of business today: John, happy birthday. It’s nice to welcome a new member to the 50-plus division of the family. The new room — in Tingle Hall in the Hamilton residence complex at the U of O. Thom checks out his half of the space and charts his plan of attack. To me, it seemed like he got everything taken care of in about an hour. Thirty-one years ago this month, John and Lydell and I all moved into our rooms in Wilkins Hall at Illinois State (our one-time home was recently in the news — it just got renovated). Thirty years ago, so my memory isn’t as clear. But: It seemed like we had a little more room. Or maybe not: I think it didn’t matter too much to me when I got there what the room and the food and my roommate and hall neighbors were like. I was just kind of happy to be going to school. My semi-wide-eyed pleasure with the new experience didn’t last long, and I fell into bad school habits and traded new roommates at the first opportunity. But in ways that I couldn’t have imagined, moving into that room started me on the path that led me here to Oregon right now. We’re camped out in a Best Western in Springfield, Oregon. How unwoodsy. Tom — Tom is spending the first night at his dorm on the University of Oregon campus a few miles away, and in a couple days we’re driving south and just leaving him here. He told us as we got close to Eugene on the drive up from Berkeley (we left home just before 6 this morning and were up here early in the afternoon) that he was nervous about the experience: living away from home for the first time, taking on all the university stuff, having an unknown roommate in a tiny room. You know: everything. When we got here, I looked at the rush of activity, the new kids moving into the dorms en masse, all strangers to each other, and I thought — hey, this would be intimidating. While we hauled his stuff up to his room from the van, I was struck by how similar this was to first steps toward separation with Tom and Eamon both: first time leaving them with a babysitter; first time leaving them at childcare; first day of school; first trip away from home without us. At the same moment you want nothing more than to help your kids grow into this world, you think, do I really need to let go? So here we are: First day of college. How did things play out when we had our feet on the ground? 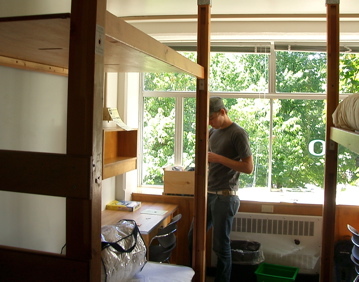 Tom just took charge, setting up his room, talking to his roommate and other guys on his floor. Kate and I went off to run an errand. When we got back, Tom was pretty much settled in. He had plans for the evening — a meeting at the dorm, then who knows. He went his way, and Kate and I went and had pizza and a beer. More reflection on this later. I got an hour’s sleep before we left home this morning. Time for bed.